Welcome to Italy! Today I have the pleasure to introduce you to Linda Tieu of Tortagialla. She has been an Etsy member for about a year, and joined our team in July this year. Her book for the latest swap caught my attention, if you want to have a look click here - but come back to read the interview! Hi Linda, nice to meet you and learn more about you! Where are you located? I live in Tuscany, Italy although I'm originally from Los Angeles. I moved here just about two years ago after quitting my job and marrying the love of my life! I was basically saved from the cubicle life and whisked away to a life of wine and pasta. I know it sounds like such a fairytale story, but it's really my life and I am totally loving it! How did crafting and bookmaking enter you life? 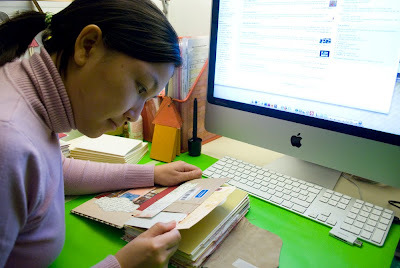 Do you have a day job in addition to being a bookbinder and organizing your shop? I'm a freelance designer by day, working in graphic design and web design…although projects have been slow this year, giving me more time to pursue my crafty interests. I am self taught in design and actually went to school for Mathematics! A mathematician, how interesting! I am a mathematician, too, and I was surprised to find out that there are quite a lot of us among book binders. What do you think is it about bookbinding that seems to attract mathematicians? There must be something about formulas, procedure and details that makes bookbinding attractive or in-tune with those who study math. It's funny because as a child I thought math was so absolute and direct. 2 + 2 equals 4 and there's an answer to everything and a right way to do things. Then as you learn more and study higher math, you realize how loose things can be and how much room there is for interpretation. I think bookbinding is a bit like that for me. There are methods, techniques and the right way to construct books...but the more I learn the more artistic, free flowing and open it becomes. I love both subjects! Let's talk about your shop. - What does your shopname mean? My Etsy shop name "tortagialla" is actually two Italian words stuck together. "Torta" means cake and "gialla" means yellow - yellow cake - a nickname my husband gave me that stuck for all my creative adventures. What kind of books do you make? 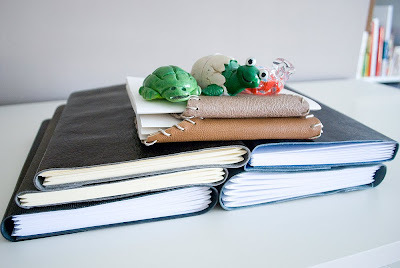 I started out by making pretty classic leather journals, but have just branched into more grungy and scrappy looking books as well as elaborating on the wrap around closures. I really love fibers, ribbons and lace as well as braiding, knotting and tying…so I'm really trying to incorporate all the things I love into my craft. I've never taken a bookmaking course before and take on a very freestyle approach to bookmaking. 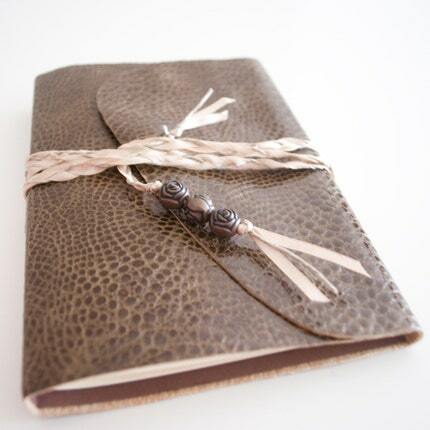 Every journal I make starts with the piece of leather in hand. The journal sort of comes out of the material itself, it is never a planned out process. I don't like measuring things, and freehand a lot as well…to me it's all about the leather and materials… the magic of pulling together raw materials into something useful and functional. What can we expect from Tortagialla in the future? I have recently gotten into zines and created one myself! It's called Pensieri, meaning thoughts in Italian and focuses on one topic each issue. I just created the first issue in August 2010 and have learned a great deal already about indie publishing and just the logistics of duplicating something. All my leather journals are made one-by-one and unique, so the mass assembly of identical books is new to me! 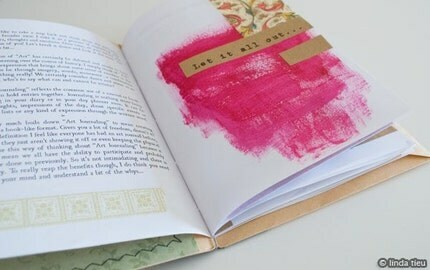 However, I love the idea of making a book and the content within. It is like a whole new realm. I've already learned a lot from the first issue going out and have lots of changes and new ideas for the upcoming issue, so stay tuned! Thank you for taking your time for this interview! If you want to know more about Linda, check out her website, and of course tortagialla on Etsy! Cool interview, Linda! I loved learning a little more about you. How wonderful to discover a leather source near your new home in Italy. You create such beautiful journals! Thanks Elissa and Terriaw - I love living here in Italy and really taking in the culture and beautiful artisantry - if that is a word?! Oh and I had not realized there was a connection of bookbinder with math... but then again it makes sense! I live in France, a sort of semi retired musician/bookbinder. We live in an area known for its leather production, its nice to have a local source for materials like this. Your journals look most attractive.